Wigan recorded their first away win of the season with a dramatic comeback from two goals down to win 3-2 at Chesterfield. With nine minutes of normal time remaining Latics looked to be down and out, but Leon Barnett’s excellent volley, Craig Davies’ penalty and Jordy Hiwula’s last-minute winner produced an amazing smash and grab victory. The Spireites had taken what looked like an unassailable lead through Dan Gardner’s spectacular 30 yard strike and a Barnett own goal. But with 15 minutes remaining Wigan showed great determination and upped their game producing a plethora of chances as the home team crumbled under the onslaught. Due to international call ups and injuries Gary Caldwell had to change his starting line up from the victory against Crewe Alexandra. Will Grigg, Jonjoe Kenny and Captain Craig Morgan were all unavailable. New loan signing Haris Vuckic partnered Davies in attack, Sean Murray made his first start in the centre of midfield and Barnett returned to replace Morgan in defence. Chesterfield had the best of the opening exchanges and after 15 minutes Latics keeper Richard O’Donnell made a superb save to deny Ian Evatt’s header from close range. Soon afterwards the home team may have been awarded a penalty when Lee Novak appeared to be fouled by Donervon Daniels in the penalty area. The referee Mark Brown played advantage only for Novak to then go down inside the box under a second Daniels challenge. However the referee pulled the play back for the initial infringement outside the area. Latics responded with Max Power drawing a save from Tommy Lee. From the resulting corner Murray saw his effort blocked before Vuckic fired over from the edge of the box. Davies then had a shot well saved by Lee before a Jacobs free-kick was tipped over the bar by the Spireites keeper. Latics might have taken the lead in the 38th minute. Davies low driven free-kick ricocheted to Daniels in the box but Liam O’Neill slid in to block the shot and the ball flew wide of Lee’s post. O’Neill was forced to limp off after making the interception. But with the match in first half injury time the best chance of the game so far fell to Jacobs. After some great work down the right hand side Vuckic found Davies in space and the big striker turned the ball into the path of Jacobs with only the keeper to beat but Lee produced yet another good save to deny Latics the lead. Chesterfield upped their game at the beginning of the second half and started to take control of the midfield. Latics were looking vulnerable down the left hand side with Power and Barnett struggling to contain the Spireites attacks. On 62 minutes the home team made the breakthrough when Gardner cut in from the left and curled a spectacular shot past O’Donnell and into the top corner of Latics net. Latics were stunned and six minutes later matters got much worse as Barnett, unchallenged on his own six yard box, inexplicably headed past O’Donnell from Daniel Jones free-kick. It looked as though the three points would be going to Chesterfield but Latics gradually clawed themselves back into the game with substitutes Chris McCann, Jordy Hiwula and Andy Kellett having an increasingly prominent impact on proceedings. Kellett forced a corner and following the corner Barnett made amends for his own goal by chesting the ball down and then firing an unstoppable half volley past Lee. 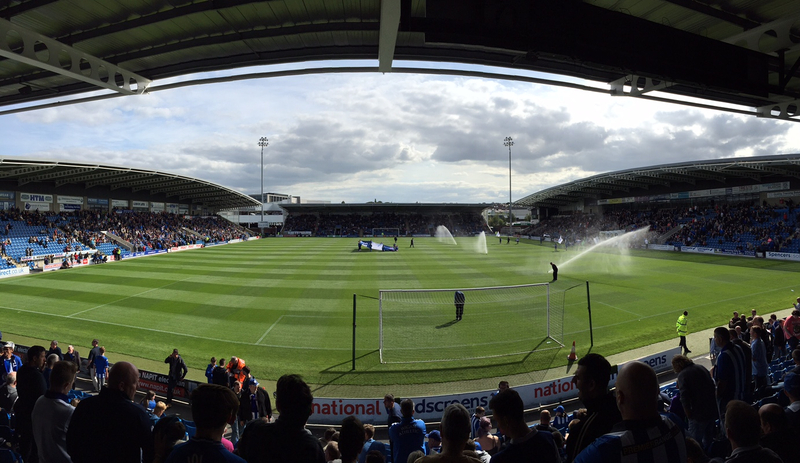 Latics now had a foothold and Chesterfield started to wobble. Davies was once again denied by Lee and then Hiwula crashed the ball against the crossbar when it appeared easier to score. Latics were now well on top and when McCann broke through into the box he was unceremoniously brought down in the area by Sam Hird. Davies had the responsibility to take the penalty against one of his former clubs and the striker powerfully converted his spot kick to draw Latics level and set up an incredible finale. As the game moved into the 90th minute Latics sealed an unlikely victory as Kellet created an opportunity in the Spireites box and despite Lee’s save Hiwula was on the spot to fire home the winner and send the 1,000 travelling fans into ecstasy. This entry was posted in Chesterfield, Craig Davies, Dan Gardner, Jordy Hiwula, League One, Leon Barnett, Wigan Athletic and tagged Chesterfield, Craig Davies, Dan Gardner, Jordy Hiwula, League One, Leon Barnett, Wigan Athletic. Bookmark the permalink.